The hydraulic motor pump BJQ-3-63/0.6 has three-stage outputs with the radial piston pumps. It has three independent sets of pump cores and control systems, which can drive three rescue tools at the same time or one independent tool. Meanwhile, we adopt American Kohler gasoline engine as its power source. The BJQ-3-63/0.6 motor pump has two levels of output and could automatically alternate between the high voltage and the low voltage output pressure according to the changes of external load. When the pump works with low pressure, its output flow is large so that the supporting tools move rapidly without load to save rescue time. 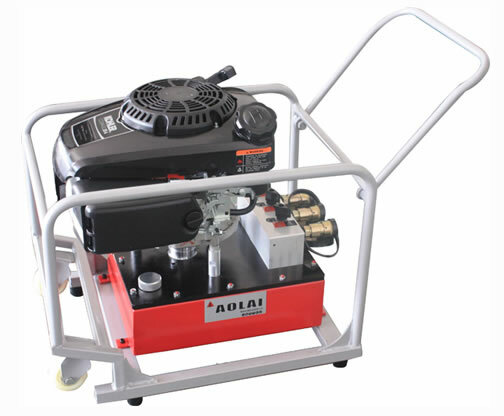 When the supporting tools work with load, the pump will automatically work under the high voltage output pressure. Therefore, it is a kind of ideal power supply for rescue tools for its working reliability, easy operation and high efficiency. Application 3 sets of hydraulic rescue tools can be driven by the hydraulic engine pump at the same time, which accelerates the rescue efficiency. Features 1. 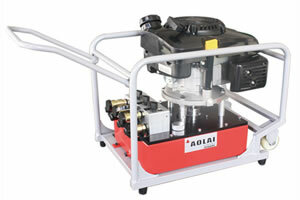 The triple output motor pump can drive 3 hydraulic equipments at the same time. 2. This pump can supply big power with high efficiency. 3. Kohler engine ensures high performance operations.